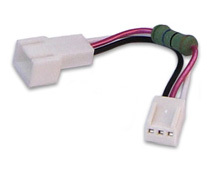 This small resistor converts 3-pin fans from 12 volts to approximately 7 volts. This basically means it reduces the speed of your 3-pin fans, which in turn reduces the noise the fan makes. We tested the resistor with a 92mm fan and without the resistor installed the fan ran at 2700 RPM. Once the resistor was installed the fan ran around 1400 RPM. The reduction in noise was significant. Fitting the resistor is very straightforward. Just plug the 3-pin fan into one end of the resistor and then the other end connects directly to your motherboard. NOTE: The resistor reduces the RPM of the fan, in turn this reduces the air flow that the fan produces. Please bear that in mind when purchasing this resistor.